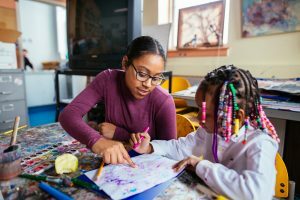 As the proverb goes, “It takes a village to raise a child.” This semester, Eastern Mennonite University (EMU) sophomore Jasmine Wilson is learning that maxim’s truth. She’s helping fix firmer foundations and expand horizons for a group of children in a Washington D.C. neighborhood with nonprofit Little Friends for Peace, an organization she’ll return this summer in a paid position. 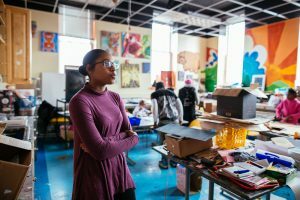 This semester, she is participating in EMU’s Washington Community Scholars’ Center, a program that combines living with other students in a house in the Brookland area of the nation’s capital and working four days a week in an internship. Wilson in the Perry School Community Service Center, where she works with elementary-age children. 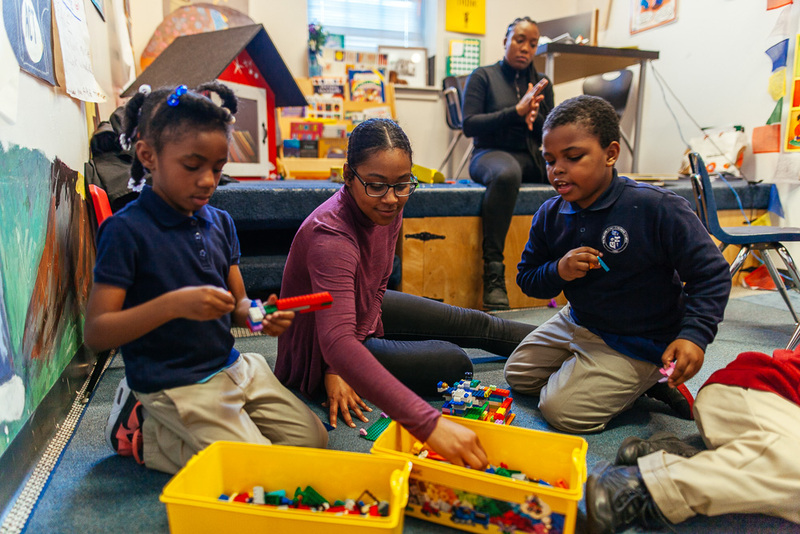 Wilson, a psychology major from nearby Woodbridge, Va., spends her afternoons with approximately 18 elementary students in an after-school program at the Perry School Community Service Center. Wilson picks up the children at a local school and walks them to the nearby gathering place. There she helps serve snacks, pairs volunteer tutors with children, moderates conflicts, and helps plan and carry out special projects. In February during Black History Month, she daily taught about a different historical figure. She’s now helping the grade-schoolers plan and plant a spring garden. She assists with outings, including a recent tour of Georgetown University and peace week activities at George Washington University. These outings open horizons for children who rarely have reason to leave their neighborhood, Wilson said. The after-school attention supports children who navigate stressful settings. They live in either a nearby housing project or a drug-rehab group home for mothers. Issues related to poverty and insecurity or the rigorous demands of the rehab program leave mothers with less energy for their children, Wilson said. The children often lack adequate supervision, she said, and some may not get sufficient food at home. Over the years “the program has become their second family,” their village, so to speak. In just a few months, Wilson has witnessed change in a five-year-old who began the year without interacting or speaking with others in his kindergarten class. Although undiagnosed with a learning disability, he had fallen behind in educational goals. He angered easily, couldn’t sit still, and sometimes had to leave early due to disruptive behavior. Now he stays the full day at school. Jasmine Wilson plans to work with children and mental health, perhaps as a family or child therapist after graduate studies in psychology. Contributing to such transformations strengthen Wilson’s career plans to work with children and mental health, perhaps as a family or child therapist after graduate studies in psychology. She’ll be following in the footsteps of her mother—a home therapist—and building on her own experiences as a nanny and a care provider in a daycare center. Little Friends for Peace, a 35-year-old nonprofit organization dedicated to peace education, has promoted nonviolent conflict resolution for years. Wilson uses its method when disagreements surface among the after-school children. Two children may both have their hearts set on working with the same tutor on a given afternoon, for example. Wilson separates them and speaks with each individually, asking him or her to think through an approach to the impasse. A polite request, perhaps, or a suggestion that they share the tutor that day. She’s received affirming feedback to her work with children. Little Friends for Peace has encouraged her to apply for a summer position at one of the organization’s nine Peace Camps, held in locations in D.C., Maryland and Virginia. “Jasmine adds a lot of positive energy into our programs and I have watched her mature and grow as she engages in them,” said MJ Park, a Little Friends for Peace co-founder and director.